Hello. This is a presentation of Bayadera. It's a Bayesian statistics and machine learning library, implemented in Clojure, that get its speed from GPU's. Interested in Bayesian methods in ML. My name is Dragan Djuric, I am a professor of software engineering at the University of Belgrade. I've been using Clojure as my primary programming language since 2009, and I teach it since 2010. I am interested in ML, especially the bayesian kind. You can find me on github, or read my blog at dragan.rocks, where you can also find this presentation. ClojureScript in browsers, node etc. Clojure is great! It's a modern, pragmatical lisp, that integrates well into today's most popular platforms. Are Java and Clojure good at number crunching? But, is it good at number crunching? It is certainly not bad, but compared to what's available elsewhere, it is not great either. One of my goals is to make Clojure great for implementing numerical-heavy algorithms. CPU is not so great either! R, Python? Even worse than Java. C? complicated, verbose platform-specific optimizations. CPU? too beefed-up. Burns as the Sun! And CPU itself is not so great either! CPUs have rich instruction sets, but that requires lots of transistors that devours energy. …which brings us to GPUs. GPUs contain very simple computing units, but it is possible to pack many of those on one chip! The features that are provided are exactly the numerical operations and parallelization support that we need! They are more powerful and cheaper each year. It's a shame that the programming platforms are from the stone age! Uncomplicate is a family of open-source Clojure libraries for scientific and high-performance computing. My main goal was to create a state-of-the art Bayesian machine learning infrastructure. For that to fly, I also had to provide lower-level libraries, since what was available at the time on JVM, was lot worse than the best tools available elsewhere. ClojureCL is a Clojure library for taking full control of the GPU with minimal overhead. Neanderthal leverages battle-tested native linear algebra libraries for the CPU and latest GPU libraries to provide the full-speed matrix support tailored to Clojure with almost no overhead. Bayadera goes beyond that - a library for Bayesian statistics on the GPU that is much faster than the fastest available mainstream offerings! 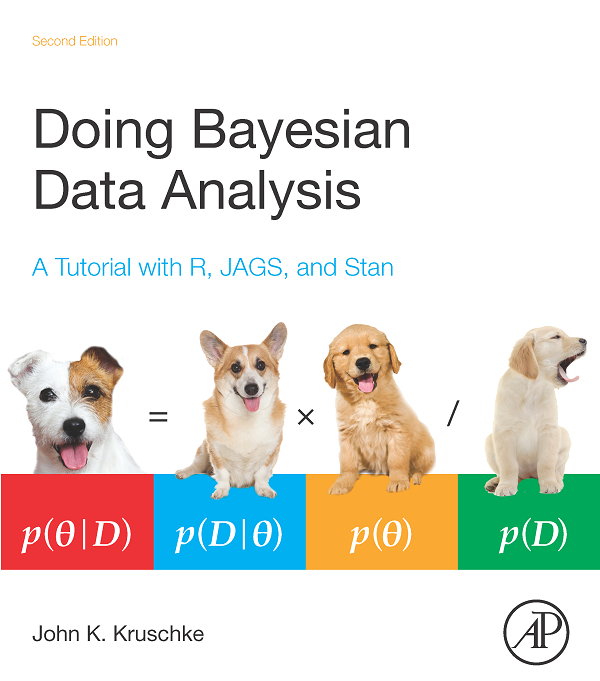 What does all this has to do with Bayes? Bayesian methods are conceptually simple and elegant (although not always easy to learn). The main challenge is that real-world models are not possible to solve analytically, and require enormous computational resources. Main numerical methods are variants of MCMC simulation, and analyses typically run in minutes, hours, days, weeks or even more. GPU are an obvious help. Numerical methods can typically be fast on GPU's. But there's a challenge: MCMC is inherently sequential so it is difficult to parallelize. How to know something we cannot observe? When could BDA be useful? Whenever we have too little data and too much uncertainty. Often we cannot directly measure what we are interested in. We can only measure something else, that we think influences it. There is rarely one true answer. More likely, possible answers are more or less probable. BDA helps us discover the probability of each potential answer by taking into account what we knew previously (prior), our knowledge of the random process itself (likelihoodh), and what we measured in the data (evience). We do that calculation using Bayes' rule. Real-world examples through the book! This book is what I would recommend as the best learning resource. It is approachable by (strong) beginners, but the examples are still from the real world analysis. Hello World: Fair or Trick coin? Since we are programmers, we would like to start with the Hello World! In BDA, hello world example is the coin throwing experiment. We are interested in the coin's "fairness", the tendency to fall on the head, or tale. We describe that with the parameter θ. Unfortunately, θ is not directly accessible. However, we can make experimet, in which we know that the process of coin throwing have binomial likelihood. We measure outcomes, that we know (by the construction of the experiment) are influenced by θ, - we gather evidence. 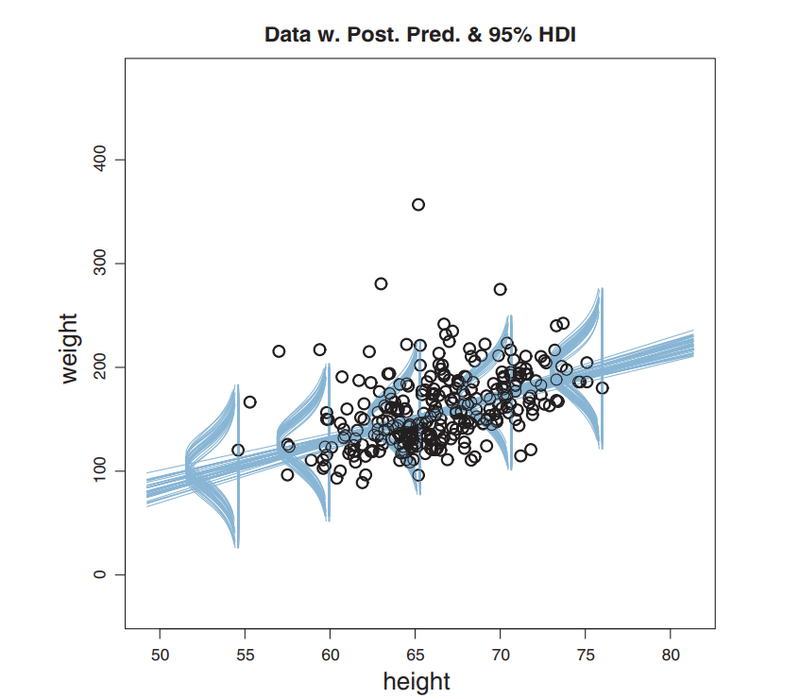 Using Bayes' rule, posterior = likelihood × prior divided by evidence. 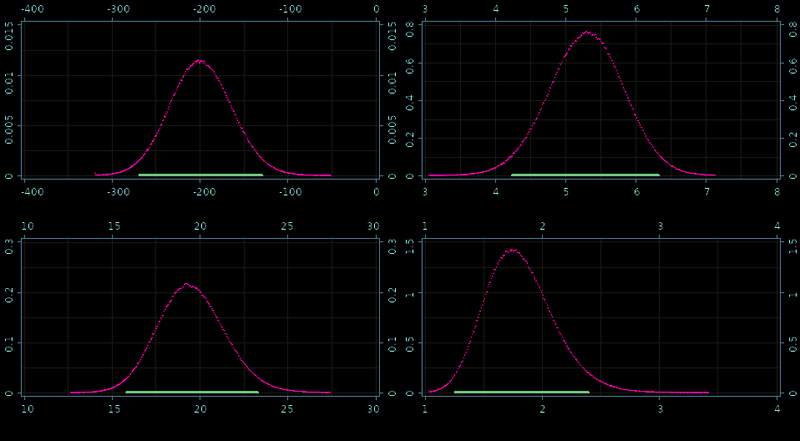 Fortunately, for this simple setup, we can calculate the posterior analytically, and the result is a general formula. By the design of the experiment, likelihood is binomial. 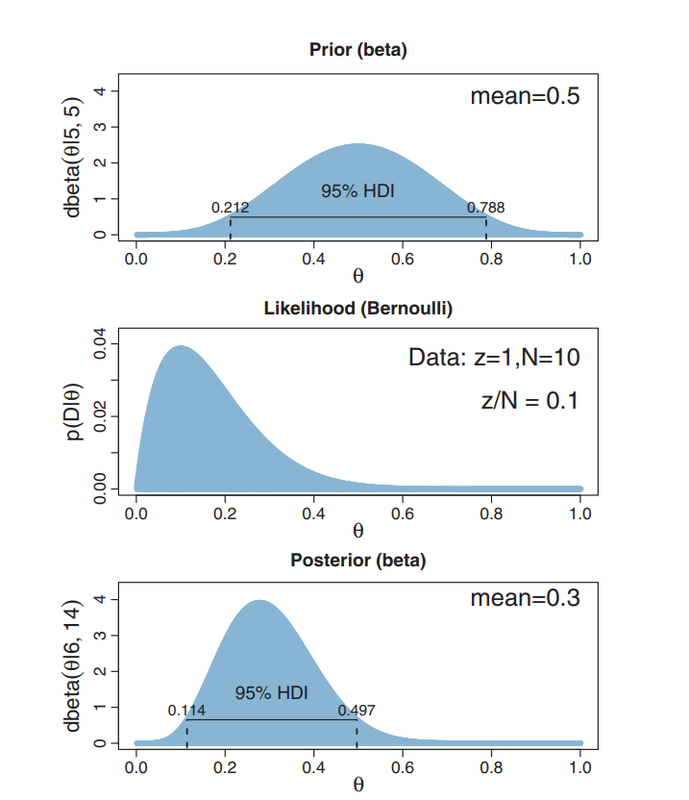 Then, if we conveniently choose a prior that "fits" with this likelihood, we can easily calculate the general formula for the posterior distribution of probabilities. In this case, we choose the Beta distribution, which is a conjugate prior of binomial likelihood, and give another Beta distribution as the answer. Kruschke's book gives an example with specific numbers. Fe first believe that the coin is most probably fair (θ around 0.5), but we are not very convinced that it is. That prior is in the first diagram. On the middle diagram, we see what the likelihood of the actual data, 1 head out of 10 flips is, for each possible θ If just one head comes out of 10 throws, it is much more likely that theta is, say. 0.1 or 0.18 than 7.45. However, 7.65 is still somewhat likely, just much less likely than 0.1. So, do we trust our prior knowledge, or the specific data outcome? Actually, both. The posterior is actually a compromise that includes both prior knowledge and the actual data that happened. Since we have analytical solution for this model, it is very easy to quickly get the answer when we plug in the specific numbers. In this case, we consider the coin somewhat fair if the θ is "around" 0.5. Arbitrarily, we set the wide bounds of 0.4 - 0.6. The probability of that range can be calculated by computing cumulate probability. Bayadera and other statistical software usually have CDF functions of all common probability distributions. Result: 0.15. It is possible that this coin is fair, but I wouldn't bet on it. Only the simplest models are "nice"
Unfortunately, only the simplest models are such "nice". Usually, we do not have analytical solution. risk assessment, decision analysis, etc. Bayadera is a highly opinionated Bayesian probabilistic Clojure library, that is much faster than the state-of-the-art established environments. I built it primarily for doing Bayesian data analysis, but plan to build on it to do machine learning. not a "me too, just in Clojure"
Bayadera aims at being a well-designed software product. Programmers should feel at home and be able to do both the usual scientific stuff, but also to build robust software running on servers! It does NOT to try to catch up to what R and Python (and Julia) already do. The main problem that held Bayesian methods dormant for 200 years, until a decade or two ago was that it is ridiculouslyhard to compute in the general case! Usually, we do not have a nice unimodal one-dimensional problems that nicely fit into analytical formulas and lead to simple results. We have to explore this multi-dimensional continuous space numerically. So, to get the answer, we have to multiply something that is hard to compute with something that is acceptably simpler, do this many (millions, billions) of times, and divide by something that is practically impossible to compute by brute force. 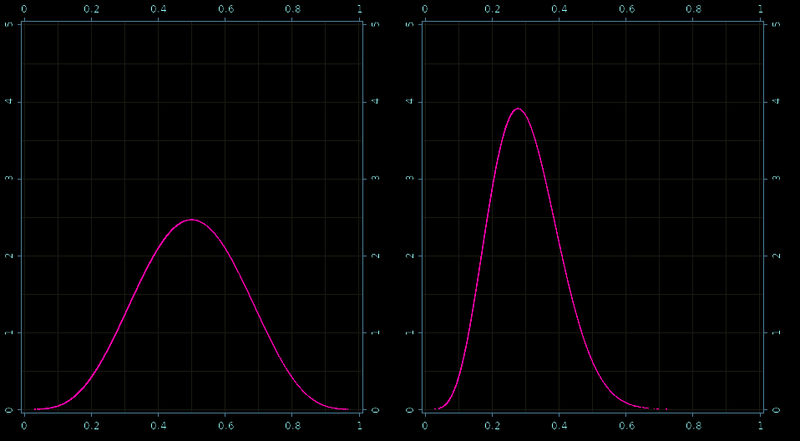 Long story short, MCMC can simulate and draw samples from an unknown distribution. With enough samples, we can approximate that distribution - the impossible-to-compute posterior that we were looking for! By using the MCMC algorithm, we are left with "just" computing zillions of "only" hard to compute things. That's why CPU-based Bayesian tools are notoriously slow. Luckily, GPU can help us in bringing that time to acceptable levels. Now, we will compute the same coin model as before, but now with Bayadera's MCMC engine, as if we didin't have analytical solution. It is good for illustration, and the bonus is that we can compare it with the analytical solution and see whether it is correct. This listing shows a real code, an I purposefully made it low-level, to show you important steps in Bayadera architecture. Once you create a model, you can use all usual Clojure abstractions, to encapsulate most of those details, so they could be used with a line or two of code. Prior and posterior - samples! But, it is not an overkill in difficult multidimensional model. There, the more samples we can get, the better. Here is another example from Kruschke's book. We have a sample data of 300 measures of people's height and weight. We would like to know what's correlation between them. Since data obviously does not fall on one line, we decide that we'll try to find a distribution of all lines that could approximate this linear correlation. Blue lines represent some of the most probable lines, and the noise at each region. We suppose that there is a connection x -> y, such that y(i) is t-distributed around β0 + β1 * xi. That t distribution also has uncertain parameters ν and σ. Practically, this model is *4-dimensional: β0, beta1, ν and σ are the 4 dimensions of that joint random variable, while K, M0, S0, M1, S1, L and H are parameters of that 4-dimensional distribution. Don't forget those 300 data points. We'd have to fit the whole thing with them! Kruschke calculates this model using Stan, and gets those quite rough histograms, that show the marginal probabilities of the 4 dimensions. Black line denotes the region that contains 95% probability (note: NOT the same as confidence intervals). We see that β0 is between -200 and -80, β1 between 3.5 and 5.3, σ around 24 and ν around 5. It took Kruschke several hundred seconds to complete this calculation with Stan/JAGS! Let's do the same thing with Bayadera. I'm writing quite plain and low-level code here to show that even without additional Clojure abstractions, it is still not more complex than the alternative R/Python models. First, we use plain Clojure to read the data and put it into a vector of parameters that we will feed to Bayadera's engine. We use some Bayadera's built-in models of common distribution and combine them into GPU code of this specific hierarchical model. Although we use some stock distribution, the actual hierarchy is specific for this model. We have to specify that in some straightforward OpenCL C code. 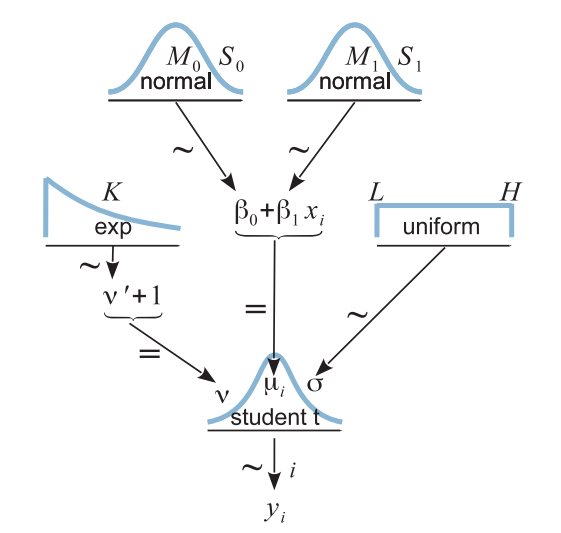 Here is the likelihood function corresponding to the model from the diagrams. We use built-in tlogunscaled function and feed it the appropriate parameters, and do this in the loop for all 300 data points. Prior is much easier. 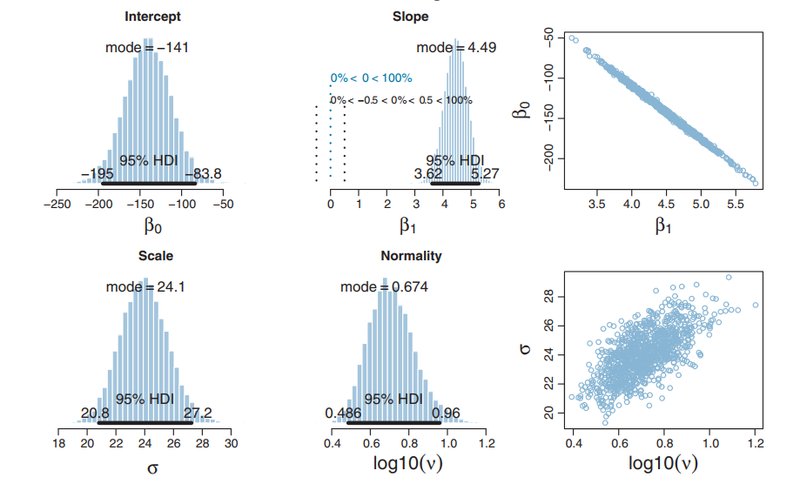 You can recognize that distributions from the hierarchical diagram are simply combined to compute the probability for any combination of parameters that we give it. The user does not call those functions explicitly. They are just specific parts of the engine that will be automagically compiled into GPU code by Bayadera. In the coin model, we did not have to do this step, because we could just reuse stock models that are already built in Bayadera. Once we created this model, we can also reuse it in a similar way. Running the inference is even simpler than in the coin example. The new thing is that the sample itself is multidimensional, so we must make histogram to calculate marginal probabilities that we are interested in. But, this is something that Bayadera can do blazingly fast with its built in functions. 61,208,576 samples in 267 ms.
What I really wanted to show you is this: despite MCMC being sequential by nature, Bayadera runs circles around the best state of the art Bayesian environments! For this particular analysis, Bayadera took 60 M samples during the exploration of that complex multi-dimensional space in just 267 ms, which is 4 ns per sample! JAGS and Stan, two best popular R/Python tools implemented in C++ spent 180/485 seconds to get 20K samples. This is 2 million times less per sample. However, it is not fair to compare those directly, since Stan tries to spend more time on getting supposedly better convergence. But, when we compare the whole analysis, we can see that Bayadera was roughly 1000 times faster, and yet produced a better result with much more precise histograms (not shown here)! 1 minute vs several days! Now, you might think - but who cares if something is 1000 times faster or slower? So what if it takes a couple of milliseconds instead of a few nanoseconds? Both are faster than the blink of an eye. Well, considering number of seconds in a day, hours in a month, etc… This is a difference of having to wait 1 second instead of an hour, or 1 minute instead of a few days, or 1 hour instead of months or even a year!